Super chocolatey brownies with icing, walnuts, and white chocolate on top! -preheat 350 degrees and grease pan. 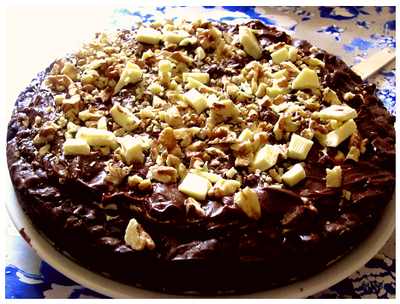 -prepare brownie mix according to package, stir in semisweet chocolate pieces and 1/2 cup chopped walnuts. Spread batter in pan. -bake 30 minutes or until done and then cool. -for frosting, mix melted butter and hot water in a small bowl, stir in powdered sugar, cocoa powder, and vanilla until smooth. Spoon over brownies. Sprinkle white chocolate and 3/4 cup chopped walnuts over top and then let cool. I made these for Phong a while ago and they turned out pretty good. As always, I fudge the ingredients and ammounts so the recipe below is what I ended up using. So I suggest you do the same depending on what you like of course. LinnLinn was kind enough to take pictures for me. 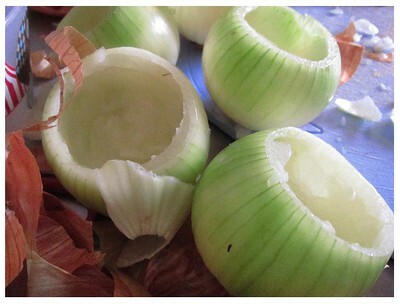 -cut peel and scoop onions (wear goggles if you've got them... seriously) and then soak them for 5 minutes in hot water. -heat oil in a skillet and cook garlic. add tomato and veggi meat. -take skillet off stove and mix in cheeses and seasoning. 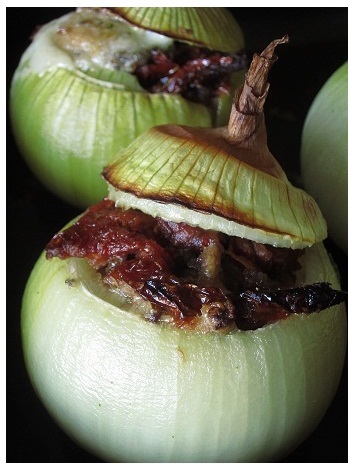 -fill onions and set in a pan, pour bullion over the onions and let pool in the pan. Put on onion caps. So these are wonderful and I hope other people get a change to try them. Unlike a lot of cinnamon bun recipes, this one doesn't need a bread machine or yeast and you don't have to wait for the dough to rise. I tried my hand at making the ingredient quantities european friendly (even though I live in Sweden I've still managed to continue using cups) so use your best judgement when you try it. Don't be afraid to make changes to recipes... they're more suggestions than rules and you know best what you're going to like in your food. Preheat oven to 200 degrees (celsius). Grease the sides and bottom of a 9 or 10 inch springform pan. Blend cottage cheese, milk, sugar, melted butter and vanilla until smooth.Pour into a large bowl. In separate bowl mix flour, baking powder, salt, and baking soda. Add flour mixture to liquid mixture until smooth and doughy- pour out onto floured counter and roll the dough into a rectangle. For filling, brush the dough with the melted butter. 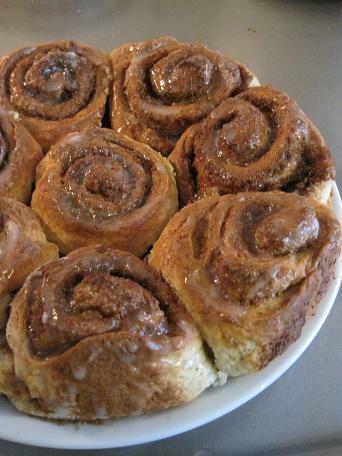 Mix brown sugar with cinnamon and then sprinkle over the dough. Starting from the long edge, roll the dough and use butter to press the seams. Cut the roll in half, the halves in half, and then those halves in half- you should end up with eight. Arrange in pan and bake 20 to 25 minutes or until brown. For glazing, mix confectioners sugar, vanilla, and cold milk. Drizzle over rolls. I don't know why they're called that but they're pretty basic at most american potlucks (and in my family, holidays or whenever someone gets the craving for them). They're really easy. 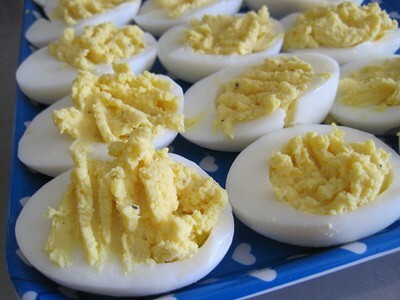 Just hardboiled eggs, cooled, peeled, and then cut in half. Dump the yokes into a bowl and set out the empty halves. 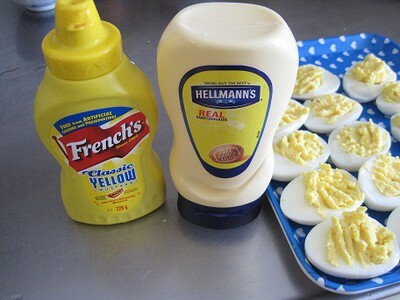 Then mix up the cooked yokes with mayonaise, mustard, and a little pepper. Fork the yoke mixture into the eggs and then set them out on a tray. It's best to refrigerate them for a while after, but that's more of a preference. Of course I use american mayonaise and mustard. The mayo I find at Ica Maxi and the mustard I've only been able to find at Coop.